Today I landed in Rome early in the morning, took the train to city center, then took off for a day of sightseeing near the train station. 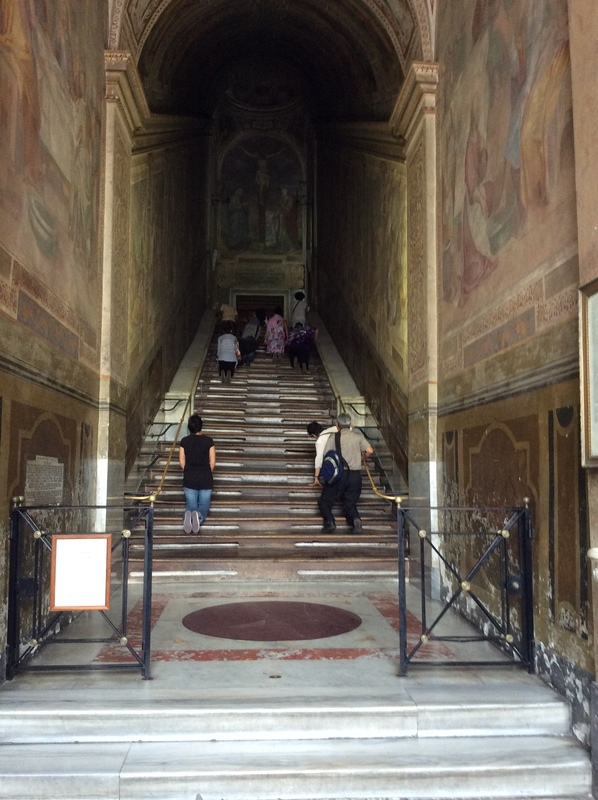 Saw several things I'd learned about at the church of San Giovanni at Laterano (that's actually the Pope's church, not St. Peter's) after my last trip, then climbed up the Scala Sancta on my knees, which is the only way permitted. These are Pontius Pilate's stone steps, brought to Rome by Constantine's Mother around 350 or so. They're covered in wood so as to not ruin them over time, and you'd be amazed at how worn away those wood steps are. There are a few 2-inch windows that let you see down to the stone steps, at spots of Christ's blood on the stone, but they're quite scratched up and I can't say I saw any blood, not that I'd know what 2000-year-old blood looks like anyhow. At the top is the holiest of holy places in the world, the Scala Sanctorum, the Pope's private chapel, which can be peeked into through a glass window. The photo from about half way up the stairs, aiming upward at the people ahead of me, is in my real camera; the iPad photo below was taken after I came back down. From there I saw a few more sights along my two mile or so walk back to the train station, then boarded a 150 MPH train to Florence, where I'll spend the next couple of days.